Hop aboard our one-of-a-kind MooMooChooChoo and see the farm from a whole new perspective! 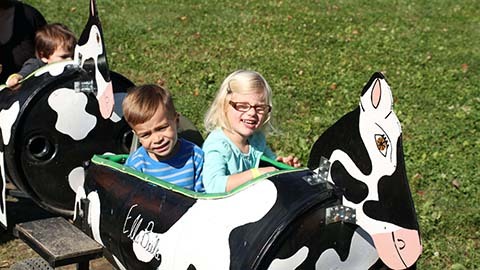 Our unique cow themed barrel train features adult and kiddie cow cars, equipped with comfortable seats and seat belts to suit riders of all ages. It’s a family-friendly farm attraction you won’t want to miss! Choose your cow car, climb aboard, and get ready for a scenic ride the whole family will love. Once everyone is ready, we’ll get mooving along our route through the farm that you’ll only experience aboard the MooMooChooChoo. On our leisurely ride, you’ll catch a glimpse of our Christmas trees and a pumpkin patch, plus see great views of other farm attractions you may want to check out during your visit. You’ll also see some friendly, familiar characters along the way. The MooMooChooChoo ride wraps up with an exciting trip right through the corn, with the stalks towering above you as we rumble along to our final destination. Love leisurely rides like the MooMooChooChoo? If so, be sure to check out our Pumpkin Express and our Trolley Ride, two other scenic rides through parts of the farm that few get to see!